I hope you are not fed up with milk and dairy, yet, because today's SuppVersity short news have a ton of it. What exactly? Well, after taking a closer look at the surprisingly high amount of HICA and the comparatively small amount of HMB in yogurt and reviewing the EAA content of six common protein sources, we are going to delve deeper into the latest evidence that shows that milk is much more than the sum of its parts, i.e. milk protein, lactose and fat and conclude on a note on another widely known Internet myth that says that people with lactose intolerance could drink raw milk without a problem. Dairy Has Branched-Chain Fatty Acids! Is There Sth. Like a Dairy Weight Loss Miracle? There is Good A2 and Bad A1 Dairy, True or False? 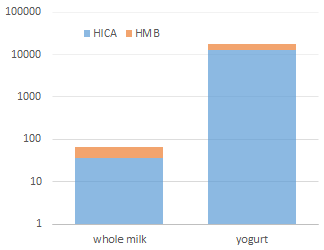 Significant amounts of HMB and specifically HICA in yogurt. We all know that yogurt is among the dairy products with the most evidence of significant health benefits. That yogurt could be a decent muscle builder, on the other hand, would be news. With ~5 mg of β-hydroxy-β-methylbutyric acid (HMB) and up to 12.5 mg of α-hydroxyisocaproic acid (HICA) yogurt would have what it takes if the values of HMB and HICA Stefan Ehling and Todime M. Reddy measured in regular yogurt were on a per gram, not a per liter basis (Ehling. 2014). How much EAA in my protein? Since I have been repeatedly questioned about the essential amino acid content in whey, milk, soy, and egg protein. I have published Table 1 which originally appeared in a 2010 study by Hulmi et al. on Facebook, already. For those of you who are missing out on the daily 12+ SuppVersity Facebook News, because they haven't liked www.facebook.com/SuppVersity, yet. I will now publish it again - as a reference source, if you will. Milk a glucose uptake promoter that's more than the sum of its parts. In view of the fact that we have already two dairy related news in today's SuppVersity article, I decided to have another "milky news" in today's SuppVersity short news item. One all the milk-drinkers among the SuppVersity readers will cherish. "[T]hat regulation of postprandial glycemia after milk consumption occurs through both insulin and insulin-independent actions due to interactions among its macronutrient components and energy content. The objective was to compare the effects of isovolumetric (500ml) beverages of whole milk (3.25% M.F. ), each of its macronutrient components (protein, lactose and fat) and their combination (a simulated milk beverage) on postprandial glycemia, glucoregulatory and gastrointestinal hormones and gastric emptying in healthy young men" (Panahi. 2014). 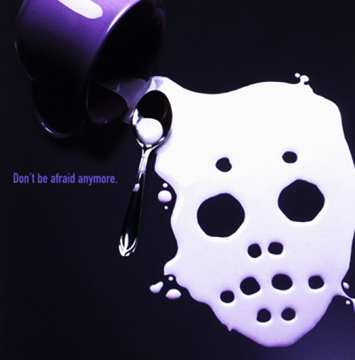 In the course of the study, the 12 young, male subjects consumed beverages containing 500 ml of whole milk (3.25% M.F.) (control), a simulated milk beverage based on milk macronutrients or milk protein (16g), lactose (24g) and milk fat (16g) in isolation. and sucralose (0.02g) were added to all beverages (Panahi. 2014). What the researchers found was that both the whole and simulated milk had similar beneficial effects on blood glucose rise after their "meal" (drink), but as it turned out the simulated milk resulted in a significantly higher (41%) glucagon-like peptide-1 (GLP-1) production and lower (43%) ghrelin areas under the curve (AUC) than whole milk (P=.01 and P=.04, respectively). Now, all that would hardly be newsworthy (at least not for regular SuppVersity readers, if the two samples, i.e. 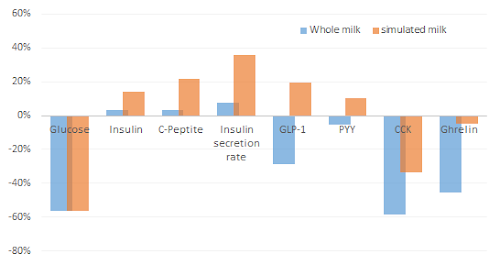 both the whole and simulated milk, didn't lower the glucose (P=.0005) levels more than predicted by the sum of AUCs for their components (see Figure 2)! "Adjusted for energy content, milks produced lower glucose and hormone responses than predicted from the sum of their components. The effect of protein/kcal on the AUCs was higher than fat/kcal for insulin, C-peptide, insulin secretion rate, GLP-1, CCK and paracetamol (P < .0001), but similar to lactose except for CCK and paracetamol, which were lower. The response in PYY and ghrelin was similar per unit of energy for each macronutrient" (Panahi. 2014). In other words: Milk is way more than the sum of it's parts. In that, the "regulation of postprandial glycemia after milk consumption occurs through both insulin and insulin-independent actions due to interactions among its macronutrient components and energy content to achieve lower postprandial glycemia than predicted from the sum of its components" (Panahi. 2014). Bottom line: Quite the "milky" short news, right? Well, I guess it may be worth topping off all these good news about dairy products with a bad one. The common "Internet wisdom" that raw milk could offset the problems of people with lactose intolerance is a myth. According to a 2014 paper by Sarah Mummah et al. who tested this myth in 16 adults with self-reported lactose intolerance and lactose malabsorption confirmed by hydrogen (H2) breath testing, "raw milk fail[s] to reduce lactose malabsorption or lactose intolerance symptoms compared with pasteurized milk among adults positive for lactose malabsorption." (Mummah. 2014) The "raw milk can be consumed by anyone" anecdote does thus belong to the realms of scientifically unwarranted die-hard bro-science | Comment on Facebook! Ehling, Stefan, and Todime M. Reddy. "Investigation of the Presence of β-Hydroxy-β-methylbutyric Acid and α-Hydroxyisocaproic Acid in Bovine Whole Milk and Fermented Dairy Products by a Validated Liquid Chromatography–Mass Spectrometry Method." Journal of agricultural and food chemistry 62.7 (2014): 1506-1511. Mummah, Sarah, et al. "Effect of Raw Milk on Lactose Intolerance: A Randomized Controlled Pilot Study." The Annals of Family Medicine 12.2 (2014): 134-141. Panahi, Shirin, et al. "Mechanism of action of whole milk and its components on glycemic control in healthy young men." The Journal of nutritional biochemistry (2014).